Russell Page, one of the legendary gardeners and landscapers of the twentieth century, designed gardens great and small for clients throughout the world. His memoirs, born of a lifetime of sketching, designing, and working on site, are a mixture of engaging personal reminiscence, keen critical intelligence, and practical know-how. They are not only essential reading for today's gardeners, but a master's compelling reflection on the deep sources and informing principles of his art. 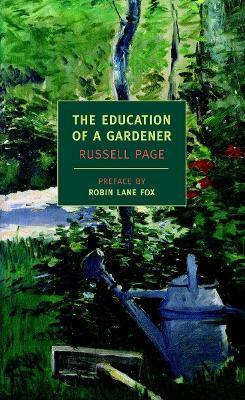 The Education of a Gardener offers charming, sometimes pointed anecdotes about patrons, colleagues, and, of course, gardens, together with lucid advice for the gardener. Page discusses how to plan a garden that draws on the energies of the surrounding landscape, determine which plants will do best in which setting, plant for the seasons, handle color, and combine trees, shrubs, and water features to rich and enduring effect. To read The Education of a Gardener is to wander happily through a variety of gardens in the company of a wise, witty, and knowledgeable friend. It will provide pleasure and insight not only to the dedicated gardener, but to anyone with an interest in abiding questions of design and aesthetics, or who simply enjoys an unusually well-written and thoughtful book. "From garden design to individual plants, he invests everything with beauty and wonder." --The Sunday Times (London) Russell Page, admittedly a bit of a mystic, is pretty much out there by himself with his verdant heart and green digits. -- Michael Pollan, Second Nature: A Gardener's Education Page has written an astonishingly beautiful book about his craft. I reread this book every three years. It explores both the mechanic and aesthetic side of gardening, while also including solid information for an academic balance. Russell Page (1906-1985) became a professional garden designer in 1928 after studying painting at the Slade School of Art in London and in Paris. In 1935 he entered into a brief partnership with the landscapist and architect Geoffrey Jellicoe. He designed a great variety of gardens throughout Europe, the Middle East, and North and South America, ranging from windowboxes and small cottage gardens to those meant for large estates, public parks, and housing developments for industrial workers. Among his best-known projects are the gardens at the PepsiCo headquarters, the courtyard of the Frick Collection, and the Festival Gardens at Battersea Park. Page was one of only three Englishmen to have received a medal from the French Academy of Architecture and was an Officer of the British Empire. Robin Lane Fox is a fellow at New College, Oxford, and the gardening correspondent for the Financial Times.